I'm probably never gonna choose another hotel when going to Vratna area. We found the hotel by chance and we were extremely satisfied. The location of the hotel is great, approx. 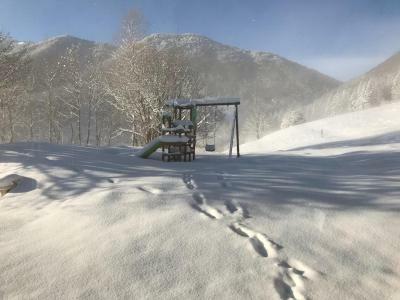 300 m from the Ski resort and the hiking paths are not far either. View is great, food is even better and ...wait for it... there is a free wellness (sauna and whirlpool). I do not have to write any further, do I ? 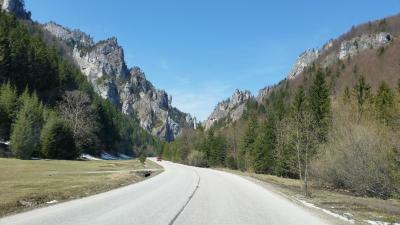 I liked the mountains around, the hotel was quite, the room was wooden, which was very nice. I think it was exactly what we expected. 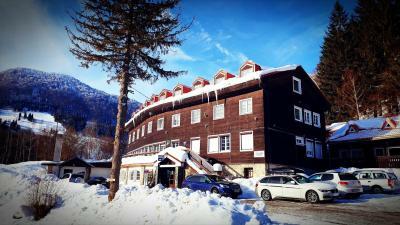 Confortable accomodation, kind staff, simple but find cuisine. If somebody doesn't insist on five stars circumstances it is perfect. 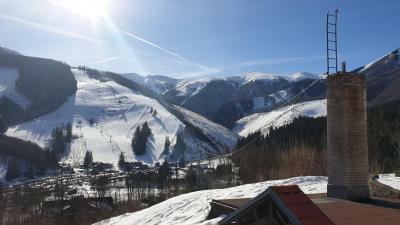 Hotel was really nice with beautiful mountain view. Breakfast included and rich, exceeded our expectations. Hotel is dog friendly, price for dog was 8 € for stay. Great variety of food during breakfast, for dinner I got offered goulash soup, and room was cozy. 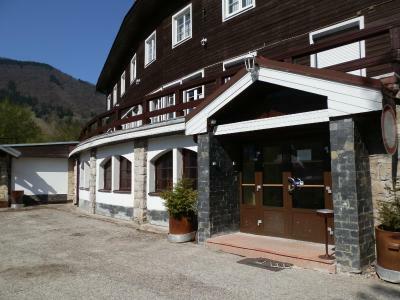 Fantastic location, good kitchen, excellent children playground in the inside. Ano.Bolo postačujùce, pestré. Ubytovanie dobre Bonusom je ùžasný výhĺad na scenèriu Malej Fatry. 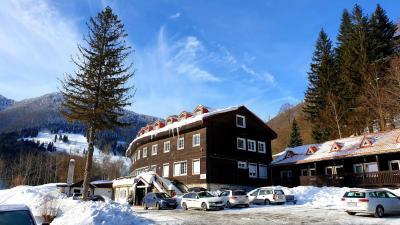 This hotel is located in the Vratna Dolina Valley in the Malá Fatra Mountains, 1.9 mi away from the village of Terchová. 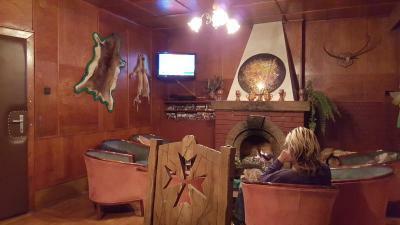 It houses a characteristic Slovak restaurant, a hunter-style bar with a fireplace and a children's corner. All rooms at Hotel Pod Sokolím have private bathrooms with shower, satellite TV and hardwood floors. 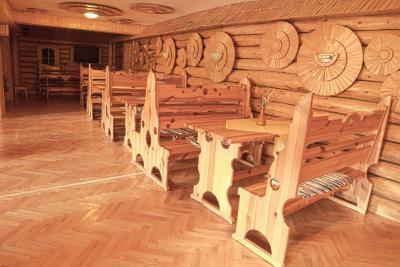 They are entirely wood-paneled. 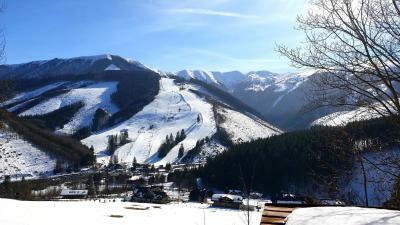 Guests can relax on the sun terrace overlooking the nearby ski elevators. Free Wi-Fi access is available in the public areas of the Pod Sokolím. 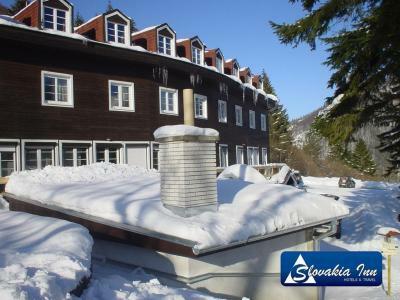 Hotel Pod Sokolím is 1,650 feet away from the Vratna Paseky Ski Resort and offers ski storage. Free private parking is provided in front of the hotel. 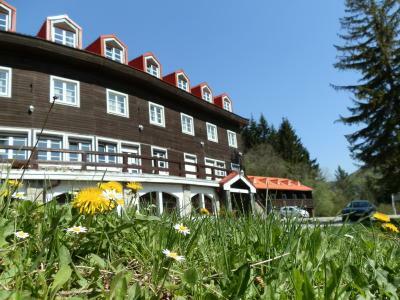 When would you like to stay at Hotel Pod Sokolím? This quadruple room is located in the attic and features a satellite TV and shared bathroom facilities in the hallway. This twin room is located in the attic and features satellite TV and shared bathroom facilities in the hallway. 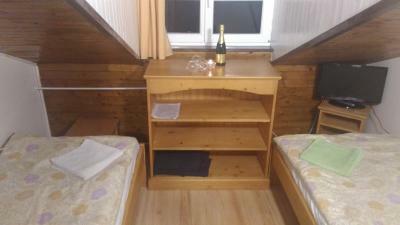 Room in the attic with wooden floors, wooden ceilings and wooden furniture with satellite TV. House Rules Hotel Pod Sokolím takes special requests – add in the next step! Hotel Pod Sokolím accepts these cards and reserves the right to temporarily hold an amount prior to arrival. 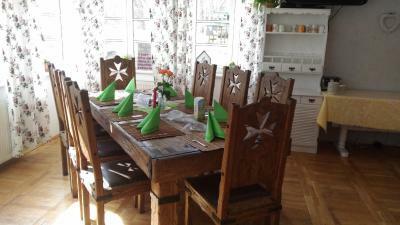 The mandatory New Year's Eve dinner on 31 December costs EUR 50 per person. The charge is not included in the overall room rate. Staff at the reception had pretty weird kind of humor and the staff in the restaurant was rude. Room was cold. Breakfast was poor for me since it was all eaten when I arrived and was not re-filled. That I didn't know this place before. The hotel needs complete renovation. Nature! Wonderful place. Breathtaking view! 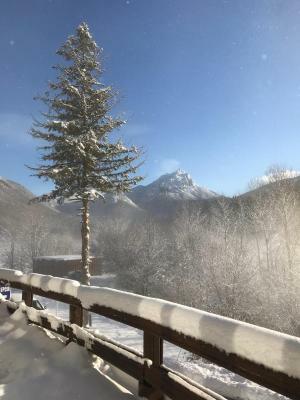 The only thing which staff a little bit messed with was check-in and checkout, but it was nothing that would discourage me from visiting the place again. Nobody cleaned our room, despite there was written they clean it up every day, dust on the floor, unpleasant staff, slow wifi. Do not order "mezonet" appartem., there is only a ladder between floors. Non-existing sound isolation in the wooden mezonet apartments. Very annoying when your neighbors are loud. Very small apartment upper floor with super steep ladder. Almost no facilities in the room except for a TV. Too expensive for the offered services. Our top floor room had a moldy smell. The only way to let fresh air in was through roof windows which made condensed water to constantly drop on the beds early in the morning (that's probably the reason of that moldy smell as well). We got to have breakfast at around 9 am and very little was left to eat and the staff didn't bring anything else, not even coffee cups. The guy at the reception desk was helpful.